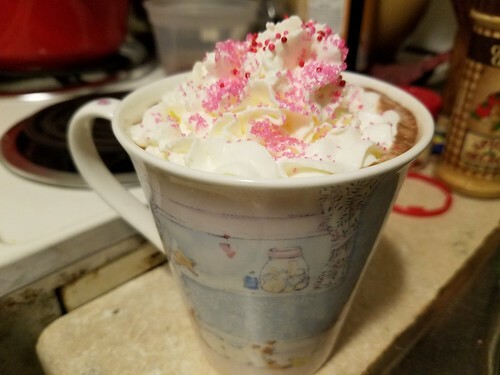 Tasting: Hot chocolate, which I just finished. Hearing: The relative quiet after turning off my audiobook at the end of the chapter. Corey’s purrs. Rudi’s even breathing from the other room. The hum of the refrigerator. Cars passing by on wet roads. Seeing: The pink glow of the fairy lights here in the living room. The glistening of the bushes above our window well reflecting the streetlight and the wintry mix. The coffee table, for the first time in a month. Piles of books to read. Smelling: Not much. Very slightly, my deodorant, and, oddly, since none has been brewed since Thursday night, coffee. I must have stirred up the bag when I pulled out the cocoa canister earlier. Feeling: The weight and warmth of Corey draped across my wrists. The softness of polar fleece pants. The slight ache in my head from the storm. Tired and ready for bed. Proud that because of that I will save my new-found curiosity about why “canister” has only one “n” rather than two until tomorrow.